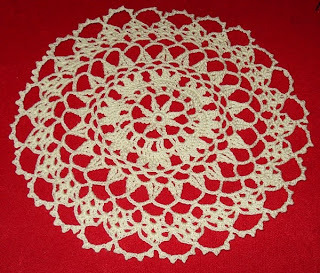 I know I don't put doilies in my home as they don't fit our modern decor, but I know others (looking at mom and grandma...) who are ready to "sacrifice" themselves to indulge my doily making addiction. I don't know who will adopt this one yet. 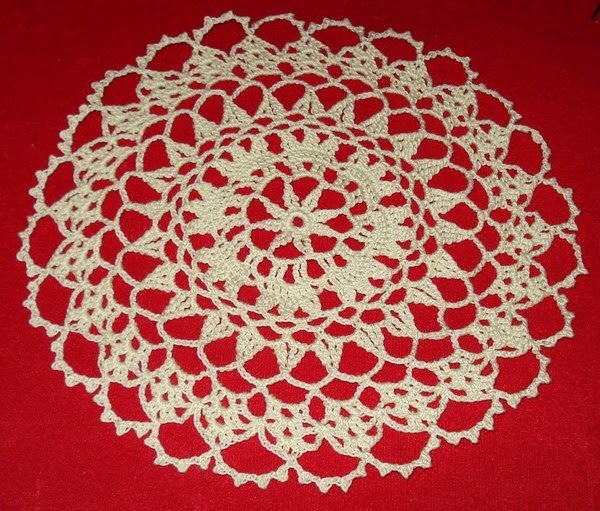 Yesterday I bought a mini crochet doily magazine (we have plenty in France), and finished this 20cm doily over the evening. I am now making the long version, in white. If this one is done in size 10 thread with a 1.25 mm hook, the white one is done in size 20 thread and a 1 mm hook. 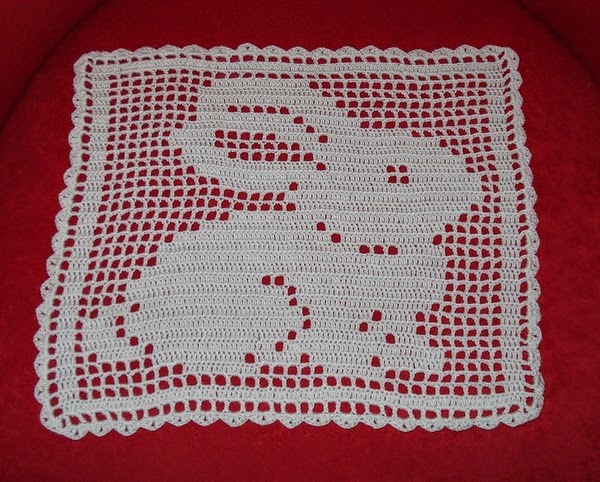 J'adore faire des napperons en crochet, mais ça ne va pas avec mon intérieur, heureusement je trouve toujours des gens pour les adopter. Hier j'ai acheté un des nombreux magazines de crochet, et j'ai fait ce napperon en une soirée, en fil 10 et crochet 1.25mm. After 4 years of on and off.... the blanket is finally finished. I have to say that taking part of thecrochet along really motivated me, and I would like to thank Sandra from Cherry Heart for initiating this. And thank you to all the people who cheered me up alngthe way. This was the occasion for me to get myself on Instagram. This time people following me on Facebook and Instagram got the freshest news. Anyway, the blanket is now9 by 14 squares, in scrap acrylic yarn, 4mm hook, and you can see I added a red and cream border. I really feared I wouldn't have enough of the cream colour, I even unknitted some items to get more, as I used discontinued yarn.But it was fine in the end. 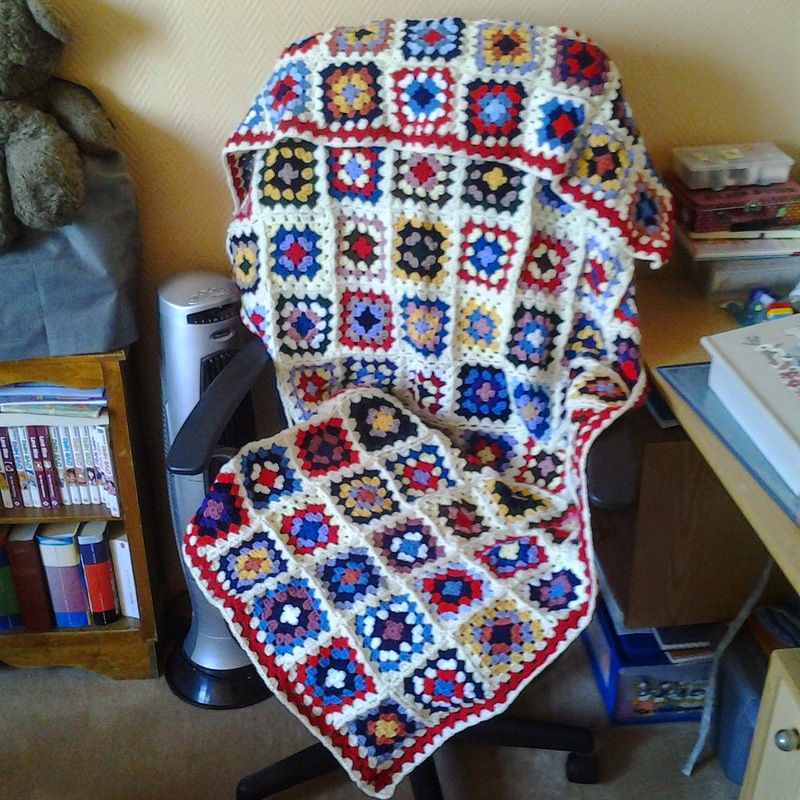 La couverture est enfin finie, grâce aux encouragements du crochet along. Je suis maintenant sur Instagram, du coup vous pouvez me chercher là bas aussi. Je crois que mes photos apparaitront en premier là. J'avais peur de ne pas avoir assez de couleur crème pour finir, j'ai même défait certains trucs pour être sure d'arriver au bout. Le problème d'utiliser des pelotes qu'on a récupérées, et pas achetées en magasin ! Mais ça a été pour finir. Here are the last squares of the granny blanket for DBF. Well, I might still need to make some more, but so far, so good. Being part of the blanket crochet along really motivated me. I got the stomach flu (again !) and after the obvious no-craft period when I was in pain in bed, I got very prolific. I made 24 squares in a day, when I was making about 4 a day before.Don't ask. March is Crochet and Craft month, and I'm already crocheting at the moment, so I'm in phase with the world. I joined the Cherry Heart blanket crochet along. 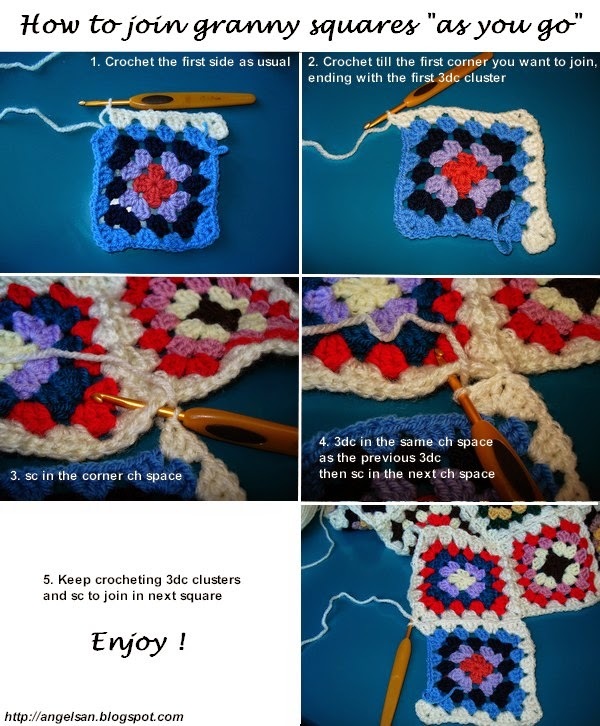 I'm making the granny squares afghan at the moment, so it sounded like a fun thing to do. To share my pictures I also had to join Instagram, so you can follow me there too. I don't knowif I will use it after that or not, it looks like a lot of crafters use Instagram, so please share your experience of it !!! Lately I got nostalgic of the time I was livingin the UK reading peoples blogs. Spring is my favourite time of the ear, and daffodils my favourite flowers. 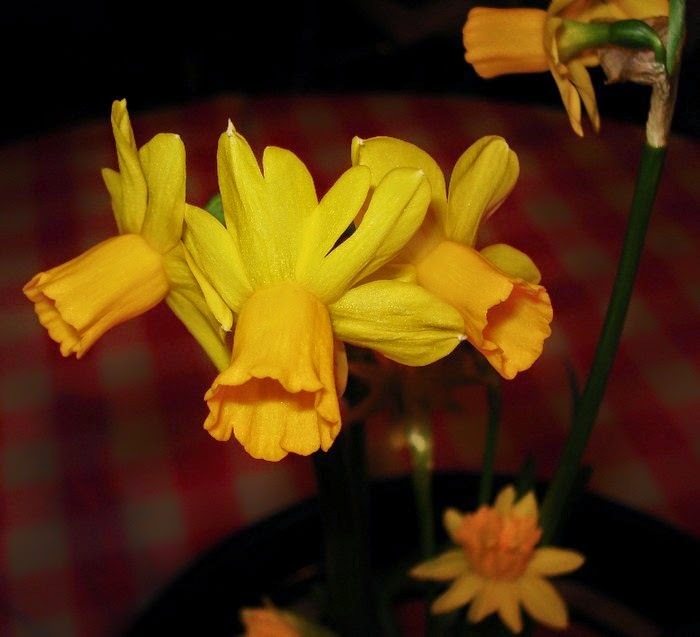 When i see pictures of new borm lambs in the fields,daffodils people bought to brighten their homes.... ah ! I reminds me of when I bought daffodils buquets in Tesco ! 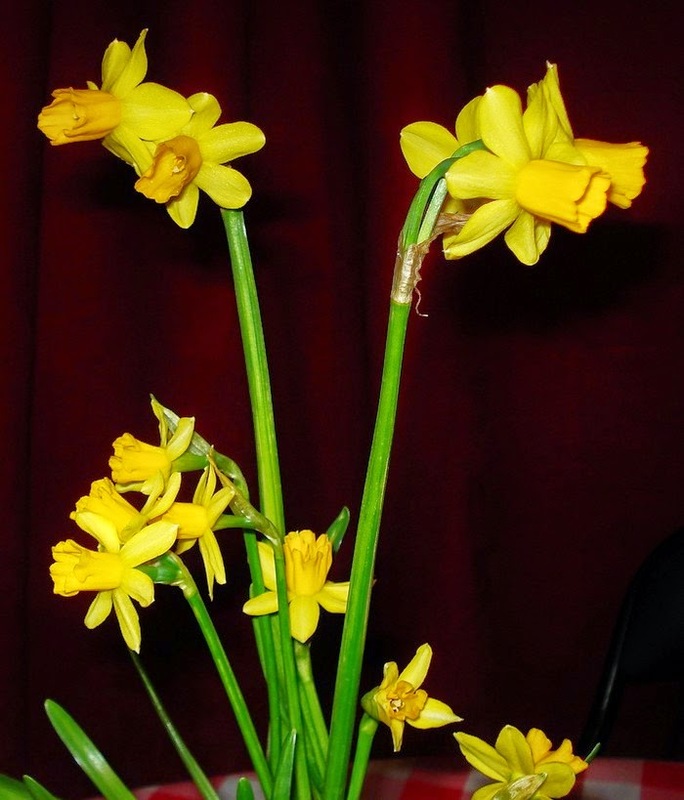 But then yesterday MIL gave me those lovely daffodils she found in a plant shop, and the world felt right again. I'm looking forward to the daffodils coming out here and there in town.... It'sa bit early for that here.